The GPX file format (https://en.wikipedia.org/wiki/GPS_Exchange_Format) is an open standard that describes geographic information. Route-Points: : this represents a stop point on a route and is represented as a transit location (routing pin) in TrailRunner mini. Given two transit locations, TrailRunner mini calculates a track between these using the OpenStreetMap Network. Way-Points: this represents a landmark in TrailRunner mini. Whenever you export files from external sources and import them in TrailRunner mini, try to keep the data straight within the expectations of TrailRunner mini. Some applications may export tracks as a series of wpt-tags which leads to serious misunderstandings within TrailRunner mini. 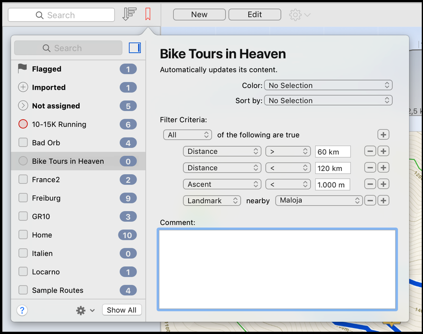 When you export routes in the GPX format to be displayed on other devices, the same applies. Some apps may not make a difference between track/route and way-points and may display all at the same time. To avoid this, you most likely want to export your route containing trackPoints only. •	What are landmarks and waypoints? Region Collections display small count markers on the map that represent multiple routes being located in that region. You can click on one of those markers and get a detail view with all contained routes and landmarks displayed in an overview map. Selecting one of the routes in the left list will zoom the map to display that route. To return back to an aspect where you again can see Region Collection markers on the map, click the globe icon in the map controls. When you choose to Show Routes in that region, the left list of routes is filtered to display these routes for you to explore. You can remove that filter by choosing Show All in the top toolbar item for Route Collections. Please note that Region Collections are an extended feature and that you can only use one for free. Full region collections require a one time in app purchase that lets you explore as many Region Collections as being displayed on the map. Collection of all biking routes with a distance of 60 - 120 km and less than 1000 meter of ascent and nearby a specific landmark like the parking spot you usually start from. To create a Dynamic Collection like the above, click on the collections toolbar icon and in the action menu select New Dynamic Collection. To better identify your collection (besides the name) you may set a color for the icon displayed in the collections menu. Also you can define in which order the collected routes are sorted. Please note that Dynamic Collections are an extended feature and that you can only create one for free. Additional dynamic collections require a one time in app purchase that lets you create as many dynamic collections as you need.